These commonly used photographic tools are easy to get to grips with. The Crop tool's icon is a scalpel, in reference to darkroom days of the past. Click, hold down the mouse button, and drag around the area of the image you want to keep. When you release the mouse button, the area around the cropping selection darkens to show that it's about to be deleted from the image. In the four corners of the cropping selection are rectangular handles that enable you to move each corner of the area to be cropped. Clicking and dragging the edges of the cropping selection between the rectangles moves just that side of the area. If you click and drag in the center of the selection, you move all of it, keeping the shape intact (see Figure 3-25). Figure 3-25. You can modify the Crop tool's selection by moving the corner rectangles or by dragging the selection edges. When you're happy with how the crop looks, click once in the central area of the crop selection or press the Enter key on your keyboard to perform the cropping action. If the crop is too drastic, select Edit > Undo Crop Image, or press the general keyboard shortcut for undoing the last action (Ctrl+Z). 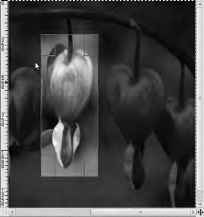 If you're cropping photographs to be printed on a fixed size of paper—for example, a 6 inch by 4 inch landscape print at your local photo shop—the GIMP has a tool option in the lower half of the Toolbox that can help you. Select the Fixed check box, and leave the drop-down box at the default setting "Aspect ratio". This ensures that your image can be scaled to print at the correct size without losing detail from two of the edges or leaving white strips on either side of the print. If your original image doesn't have the correct aspect ratio for the print size you desire, you can type a width-to-height ratio, such as 6:4, into the box just underneath, instead of the default value Current. That way, you don't have to think too much about print resolution and exact pixel sizes when you're cropping, because if the aspect ratio is correct, the photo shop's computer should take care of scaling the image to fit the paper. Portrait and landscape buttons appear to the right of this box; they can help you switch quickly from 4:6 to 6:4 or whichever aspect ratio you require. Most cathode-ray computer screens had a 4:3 ratio, just like their TV tube cousins. Perhaps because of this, many digital cameras capture images at exactly 4:3, but there are exceptions—including the Nikon D series of digital SLRs, which use a pixel ratio close to 6:4, or 4:6 for a portrait shot. Many of the newer flat-screen displays have a 16:9 aspect or other widescreen ratio, intended for movie or HDTV playback without black bars at the top and bottom. Like the Move tool, the Rotate tool can be used on a layer, selection, or path. It has an icon with two blue boxes and two curving white arrows in the corners. By default, the pivot for the rotation is the center of the image, represented by a light blue crosshair in a circle. If you don't want to rotate the object around the exact center of the image, mouse over the crosshairs; a small Move tool cursor appears. You can then click and drag the pivot point anywhere in the image you prefer. Next, drag the slider in the Rotate pop-up window, or enter a numerical angle for the rotation (using a negative number for counterclockwise); see Figure 3-26. If you prefer, click the object itself, and drag it with the mouse around the rotation point. This manual method isn't very precise, but it does offer quick results. Figure 3-26. Move the crosshairs of the Rotate tool cursor to set the pivot point. Precise angles of rotation can be set using this tool's dialog box. 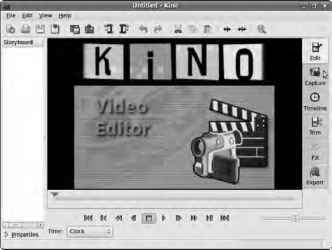 In addition to creating montages and special effects, one very useful application of the Rotate tool can be applied when the camera was inadvertently tilted to one side during the original shoot. The human eye is good at noticing when the horizon in a landscape shot isn't level, even if it's only by a fraction of a degree. 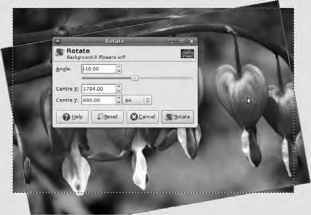 The precise control offered by the Rotate dialog box lets you fix this common photographer's mistake quickly and easily. To help you get this operation right, you can click and drag out a horizontal or vertical guide from the GIMP's rulers at the top and left sides of the image window, respectively. A vertical guide can help you align the wall of a building, but watch out for distortions in perspective caused by the camera lens.